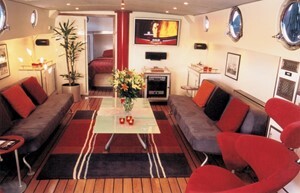 She has one Master Cabin, a large open plan saloon with flat screen TV, two sofa beds, “Orange Peel” chairs and dining table. In the mid section is an open plan Galley and navigation station, a generous sized shower room and heads (loo). The engine room houses a 6 ltr New Holland engine with ample room for maintenance. The top deck is designed for entertaining, sun lounging and storing sports equipment and there is a forward compartment for anchor & chain plus 8 sail canvas bean bags. She has a stern mounted dinghy or jetski rack with a retractable lifting crane. The aft deck has a fixed seating and dining section plus a sail canvas awning. Gentoo is fully fitted for ocean cruising with diesel generator, inverter, bow-thruster and electronics package. She has recently undergone a £50,000 refit and hull plating exercise and is available to buy outright with an annual residential mooring agreement on the Isle of Wight.